Mammoth incursion in Swindon, as mooted in Lost in a Good Book This was one of the first batch of four postcards, printed for the publication of Lost. The others being 'Poor Speling', 'Swindon Guggenheim' and 'Sarcasm recall notice'. The time taken to hand print black and white pictures was too great. 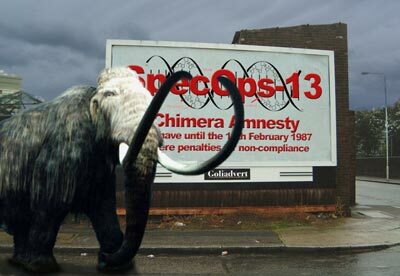 Well, this is a mammoth, kindly inserted into the street by Messrs. Photshop and co. The sky was replaced, as was the poster behind, advertising a 'Chimera Amnesty'. Quite what a Chimera looks like is anyone's guess, but they are reffered to in the book as a sort of weird experiment, created by illegal genesplicers out of bits and bobs in their garden sheds. It's a story in itself, really, and might be one day. SpecOps-13 often have amnestys, I like their logo especially. Sadly, the street is not in Swindon, it's in West London somewhere. 500 editions, all numbered, colourd postcard. Legend on reverse reads: "Views of Swindon. A six-ton adult male belonging to the Grampian herd takes a short cut through Swindon. He was reunited with his herd the day after this picture was taken."